Thank you Jesus for Chopta – snackettes. 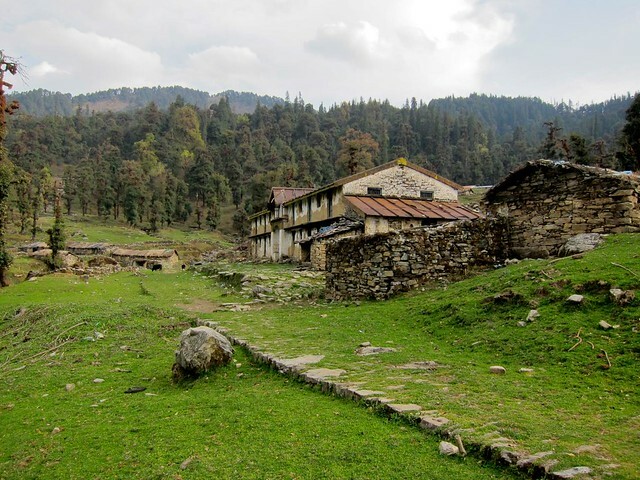 As our taxi to the tiny, remote village of Chopta approached the Himalayan foothills, our frustrations from a very rough start began to melt away. 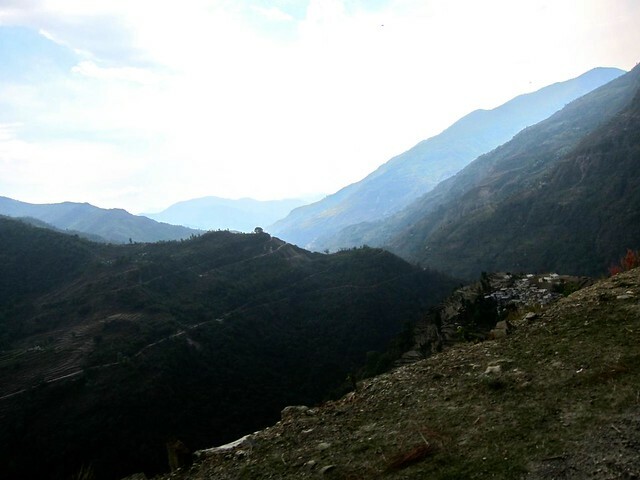 The road climbed higher and higher and slimmed to a winding, dusty line, barely clinging to the steep sides of the mountains. 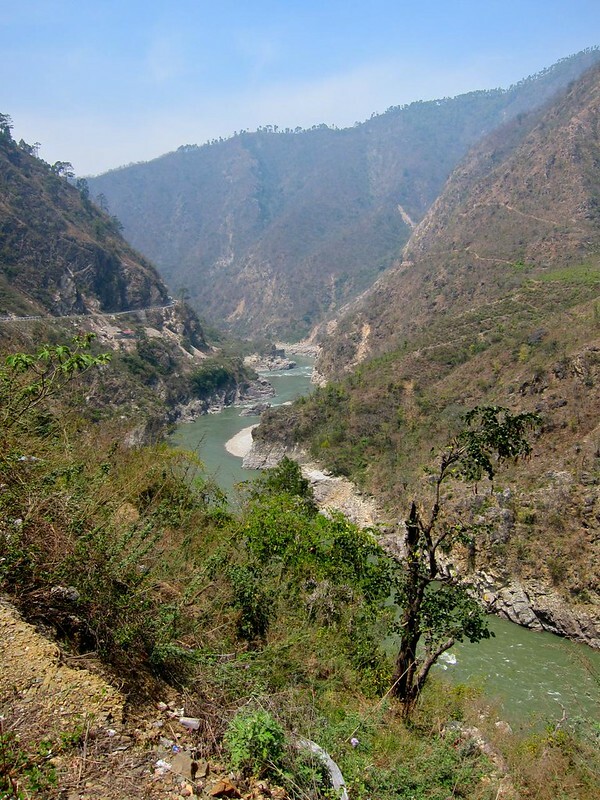 We sped along, passing the occasional overloaded utility truck barreling down the mountain, and looking out our window at the Ganges hundreds of feet below made us glad we were on the inside of corner on the turns. Knowing we were headed into the mountains where cell service can be spotty, I whipped out my Macbook to get some work done while Steph attempted to rekindle a friendship with our driver. To prepare for the weeks holed up in the mountain villages ahead, we stopped off at the last major town and unloaded all that its ATM machine would give us. Back in the car, time seemed to fly by, and before long, we saw our first peek (peak?) of the majestic Himalayan mountains in the distance… Steph grabbed my arm and let out a dramatic gasp; it was massive and beautiful. (…and the mountains were pretty nice too. 🙂 ). The villages on the map slowly began to tick away. We were having fun; yes, this was traveling again! Our taxi climbed ever upward, eventually towering over a bright green maze of stepped farming terraces. 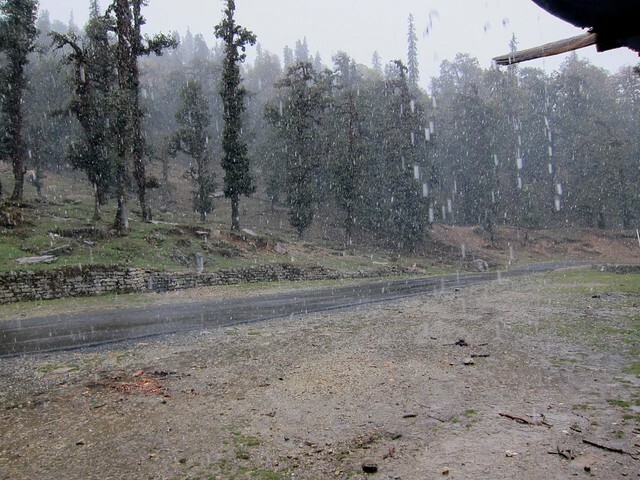 Rain set in as our taxi rounded the final ridges leading into Chopta. But thankfully, traffic this far out was nonexistent (I noticed that the cell service was as well…). Only minutes earlier, I’d uploaded all of the work I’d done that day up to the web server so my colleagues back in Boston wouldn’t be inconvenienced – whew. Another hair-raising, foggy corner or two, and we were finally there. We paid our driver the agreed-upon amount, without bothering to bring up his brother again (amazing what a change in scenery can do! ), and we wandered down a small dirt road following a sign to a guesthouse we’d found recommended online, The Maya Deep Herbal Resort. When we arrived at the hotel, the old caretaker greeted us and showed us our room in his beautiful red-roofed cottage, while his sons served us hot milk chai tea. Ahhhhh- this place was exactly what we were looking for. Just a day earlier, we were dodging beeping traffic and pooping cows in a crazy city (as much as we loved Amritsar, really, it was batshit crazy walking around there); now, we could finally exhale, stretch our arms to either side without touching another person, hear nothing but our own breath and the flapping of birds’ wings. It was the first time on our trip that we had encountered any semblance of cold weather, and the crisp cool air reminded us of the fall season we had missed back home. As soon as the sun dipped behind the Himalayas in the background, it started to get cold…fast. Soon enough, we heard pounding on the roof of our room and ran outside to find hail, and eventually snow, pelting the grounds of the hotel! Good thing we bought those North Fake jackets (for $27! 🙂) back in Rishikesh! We decided to stay at Maya Deep for a couple of nights. I should note that we never did figure out what was particularly “herbal” or “resort”-like about it… but that was fine with us. It was completely quiet (we were the only people there) and relaxing and a much-needed break from the crazy cities of India. About the only problem with the place was the complete lack of cell service, which I’d need to get any work done online. I knew I’d need to get creative to post my work, but at least for that night, I was covered by my earlier post. Another tiny problem that we should have taken to heart more seriously that first night was the issue of showering in Chopta. 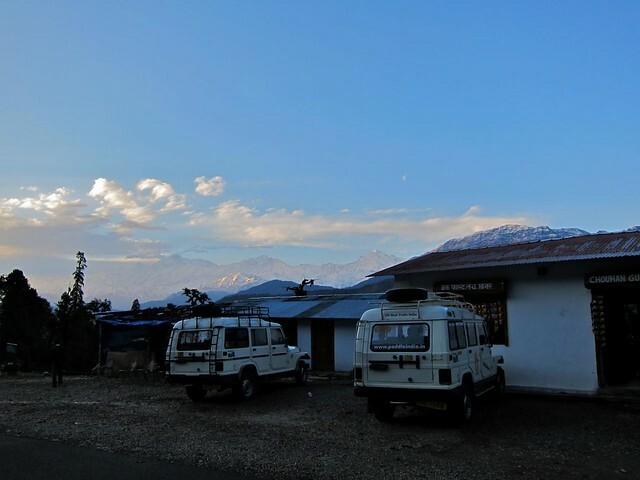 There is no internal heating or insulation in any of the buildings in Chopta (or anywhere else we ventured in northern India), meaning our room and bathroom were freezing– definitely hitting somewhere in the 40s at times. We were able to order a bucket of hot water from the kitchen to pour over us for baths, and the first time around, it was a little exciting (we were used to taking bucket baths, but never heated bucket baths, delivered by the hotel staff…) What was at first sort of fun and novel got real old, real fast, and it became impossible to bathe some days. Even in spite of the heated water, there were long stretches of time between throws of water when I’d need both hands free to soap up, where I was left shivering uncontrollably and utterly miserable. More on that later. On our first morning, we spent the day hiking the various hills in the area surrounding our guesthouse. 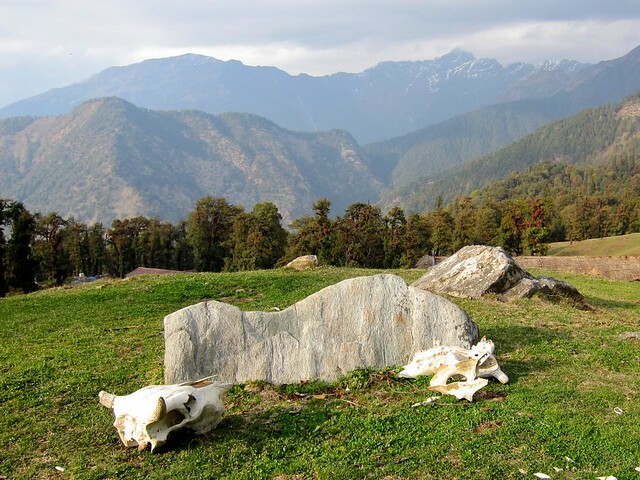 Chopta was gorgeous, like a miniature Switzerland: cows with bells ringing on their necks grazed in the green hills, cobblestone cottages dotted the landscape, villagers worked the land all around. That night, our host family served us a delicious dinner in our room: dahl (lentil) curry soup, chapati (unleavened bread– the ubiquitous utensil of India), papad (a spicy, thin fried cracker), sliced cucumbers with masala seasoning, curried cauliflower, hot chai tea, and steamed rice. 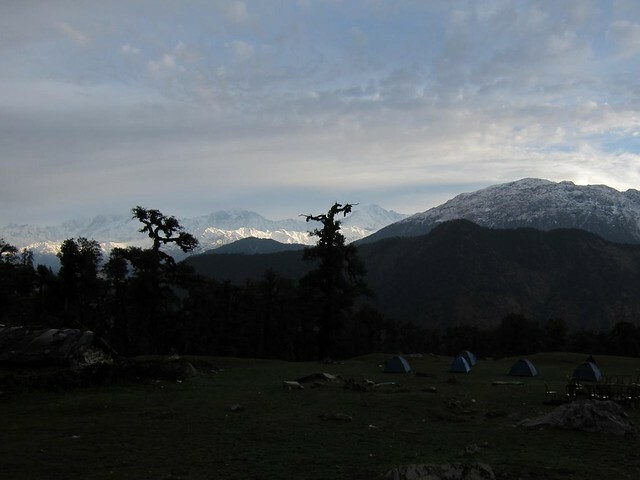 Looking at that image above, I don’t need to tell you hold cold it was in Chopta, especially at night. During dinner, we would bundle up as much as possible during dinner and throw blankets from the bed over our legs just to stop shivering. After dinner, we would immediately go to bed (usually by 7:30pm!) and not leave its confines until we absolutely had to. Unfortunately, despite the freezing rain that pelted our hotel each night, I still had to find a way to send the work I’d done that afternoon to my colleagues back in Boston. 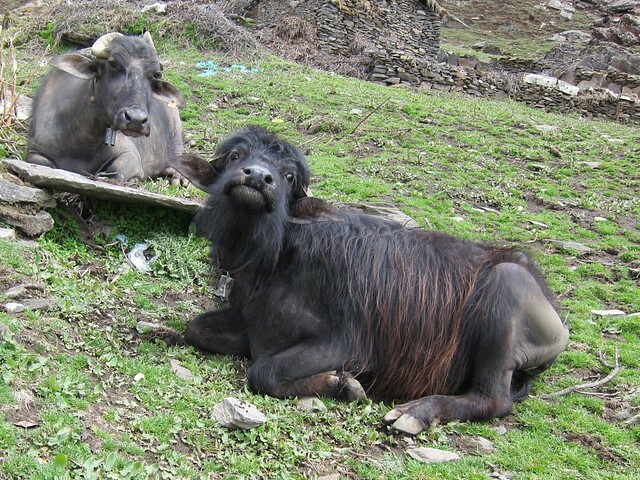 I had to wait until nighttime each day to post my work, because there is no electricity in Chopta, and the hotels in town only turn on their generators for an hour or two each evening (usually starting at 7:00). Again, there was no cell service on the grounds of the hotel, so after charging my laptop for 30 minutes I would have to hike out into the mountains to find a signal. This particular night, I had just finished getting some charge into my laptop by around 8pm, so I strapped my headlamp on, grabbed my macbook, internet dongle, rain jacket and umbrella, and set off down the stairs. Because the caretaker locks the gates to the hotel each night immediately after dinner, he agreed to wait up while I went to the top of the hill to “make a call”, and I set out into the dark, driving rain. It was pouring. It was freezing. It was pitch black. I ventured out again, and despite looking hard with my flashlight, I was soon on the path in the same part of the woods, listening to crackling forest sounds and getting increasingly nervous. I’d already gone back once, so I pressed on. The path just kept going, and the rain was getting heavier and heavier. At this point, I knew I was on the wrong road, and merely hoped that it too would lead to the main road. I came to a fork in the path, chose a left turn, then promptly stepped deep into a puddle, soaking my socks. Frustrated, my heart beginning to race, I picked up the pace and wound around a couple more turns. I began hearing my footsteps echo in the trees around me, and to my nervous mind it sounded like I was being followed. Suddenly, I came to a guardrail – the main road at last! By then I was about 300 feet down from the tea stalls. I hiked up and found one of the shops, and ducked inside one of the tarp walls, as the rain was too hard to open my computer outside, even under an umbrella. Despite my last-minute worry as I went in, thankfully, nobody was sleeping inside, and I sat down, pulled out my computer, and hooked up the internet dongle. Fingers crossed…. I tried all I could fiddling with the settings, but there was nothing there. No bars. I had my Android phone in my pocket – maybe it’d get a better signal than the dongle? I turned it on and switched on internet tethering, making a wifi cafe of this tin little tea shop with tarpaulin walls. A faint single bar signal appeared on the Android – a surprise! I connected my Mac to the wifi and pressed the send button. Fail. Pressed again. Fail. No web connection. It wasn’t going to happen from the tea shops. I considered walking further up the road where I knew there was a ridge and probably better service. But we’d been told that these mountains have large cats – cougars, and even tigers in the lower elevations – I admit I was scared to walk up the hill at night. As responsible as I always try to be, my work would have to wait this time. 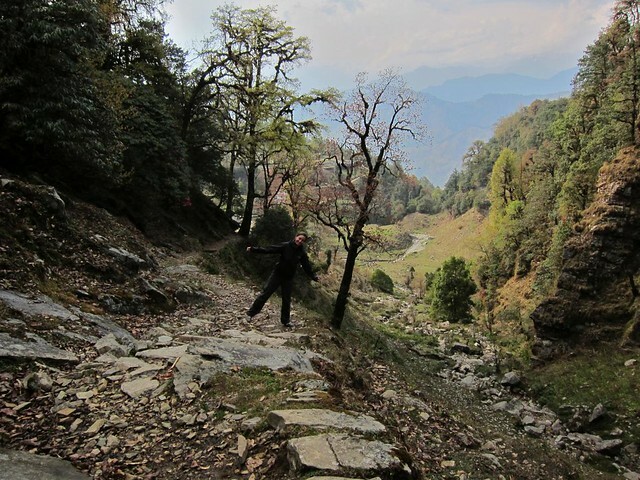 I resolved to walking back to the guesthouse, this time easily finding the 50-foot long road that took me straight in. 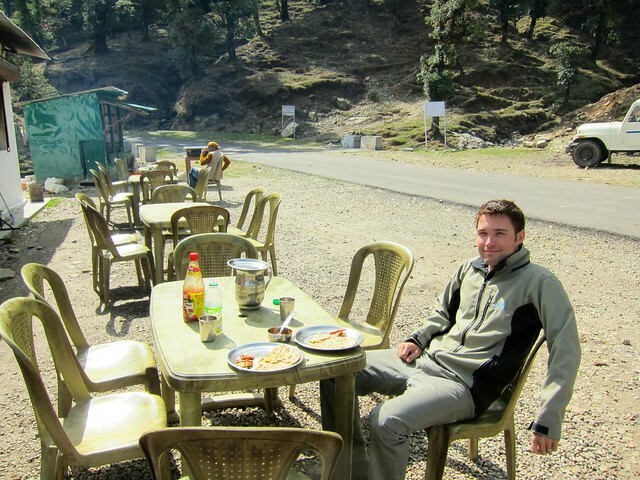 The next morning, we loaded up our packs onto our backs and trekked up the hill to the next hotel. When we reached the ridge, I was able to check-in online and post my work; fortunately, the delay didn’t appear to be a major inconvenience to anyone back home. What a relief and a nice benefit to working in a timezone 12 hours apart! We unpacked our bags at the next guesthouse, Chihuan, and with a second glance at the cellphone signal, we were there to stay. Unfortunately, our stay at Chihuan did not start out easily, as Steph and I both became quite sick for a couple of days. This wasn’t the first time we’d been ill in India, but being sick in Chopta was particularly unenjoyable: no heat in the rooms, no electricity aside from 2 hours of generator power around dinner time, no warm water for washing (they would also, however, deliver hot water buckets from the kitchen during the day if we asked), and the bathroom was cold as ice, with an open window that exposed it to the outdoors. I won’t soon forget getting out of bed in the dark to vomit (and more) in the pitch-black freezing bathroom, shivering, only to clean up with numbingly cold ice water from the faucet! The day Steph became sick, she had just taken a hot-water bucket shower (she didn’t know she was sick yet); when she got out, she was so cold that she was shaking uncontrollably and continued shaking for several hours after, despite being fully dressed and bundled up. I put her out in the sun and and gave her some hot tea, but nothing helped. She eventually relegated herself to lying under the covers in our room under 4 heavy winter blankets (where she remained for the next 3 days)… but even with that, she was unable to get warm. Eventually, Steph realized she wasn’t just cold– her body wasn’t handling the cold because she probably had a fever. Sure enough, it was 103 the first time we thought to check it. We got a little worried, and did some research to make sure we’d be able to get her down off the mountain if it reached a dangerous enough temp (another 0.5 degrees higher was our breaking point). Despite lying in an absolutely freezing room with no electricity and suffering from major bouts of boredom, Steph got better after a few days – no small thanks to some very kind Ukrainian girls we met who offered up some excellent fever-reducing pills! At first, we’d assumed we were sick due to the unhygienic conditions in the kitchen. The guys who ran the hotel, who were fantastic hosts, unfortunately spent much of the day fixing up the stoves and ovens of the hotel, which were made of yak dung (a lot like mud as a building material). Despite sometimes cleaning up before cooking, they– well– didn’t use many utensils when preparing our food… However, one day, after asking them if they could refill Steph’s water bottle for her, I learned the real reason that we had been sick. As she lay shivering and sick in bed, I took her water bottle outside to have it filled and came back into the room a few minutes later: “Well, I know why you’re sick.” After handling her bottle to one of our hosts, he had carried it across the road and filled it from the river stream that flowed by the hotel – the same stream that runs through the buffalo pastures. Before then, we’d wrongly assumed that the drinking water at the guesthouse was being boiled, but now we knew, and without any purification on-hand (our Steri-pen’s batteries had died), buying water was the plan for the remainder of our time.